The excitement is real, the energy, electric as the beautiful people with pearly whites and excellent smells about them schmooz and schmaltz on the red carpet under the bright lights and in front of the cameras. Cinequest returned in top form to kick off its 28th year. This year's festival opener was the world premiere of the film Krystal, helmed by the veteran actor and star of HBO’s Shameless, William H. Macy, who also stars in the piece. Macy was also one of this year’s Maverick Spirit Award honorees, which is Cinequest’s most prestigious award. Along with him are other high caliber thespians Felicity Huffman, Rosario Dawson, a previous Maverick Spirit Award winner, and star of Netflix’s shows, Daredevil and Luke Cage, as well as The Flash’s Grant Gustin. The film stars Nick Robinson as Taylor, a good, old-fashioned 17-year old Southern boy with a heart condition who falls in love with a former stripper and addict named Krystal (Dawson). He joins an Alcoholics Anonymous group just to get closer to her. From here, all sorts of hilarious hi-jinx and a little bit of heart ensue. The film hits many beats tonally from the farcical to the touching. Macy’s direction feels sure-footed, and not as though he is micromanaging his actors. He wisely lets them do what they do and it creates spaces for great magic between the players. Macy also has space to be funny as an actor here. His director's hat doesn’t get in the way of his performance at all. A surprising standout of this film is T.I. Harris in a small part as an antagonist. He walks the line of menacing and at a later point in the film, conflicted. His inclusion is all sorts of entertaining and yet contains feeling. Veteran character actor William Fichtner provides some of the film’s biggest laughs as a deviant doctor. 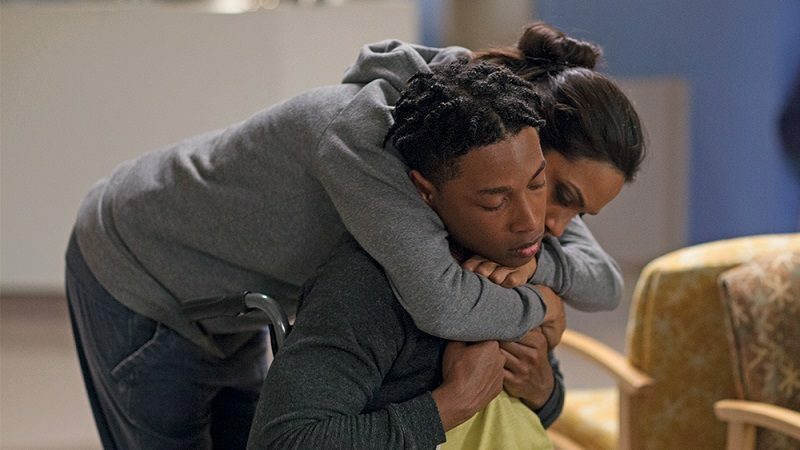 The other standout is a passionate Jacob Latimore, who plays Krystal’s paraplegic son Bobby. His position is one of snark and at the same time one of incredible emotion. One understands how he could be so angry at times, having been paralyzed by his own father who ran him over and never stopped to see if Bobby was okay. Yet, the relationship he builds with Taylor, you could argue, is the real heart of the story. The wool is pulled over the heads of the audience by the fact that the film is billed as a love story between Taylor and Krystal, but the two become connected to each other. The film won’t break any doors down for attention, but one feels the love put into the making of the picture and all of the heart show up on the screen. Particularly fitting when considering Taylor’s heart condition. Heart is one thing this film brings in spades and it is genuinely and enjoyable experience. Following the screening, a conversation with Macy and Rachel Winter, producer of the Dallas Buyers Club took place. Macy shared wonderful insights into the making of the film, the most interesting of which probably is the fact that T. I. is so talented an actor that just by going on the notion of the character he would play and what the story was about, he agreed to star in the picture. “[T.I.] is so good in this thing and he’s such an interesting guy, but I swear to god, I don’t think he ever read [the script],” Macy revealed to laughs in the audience. Meanwhile Winter expressed the elation she felt being able to realize the film after 14 years of ‘getting to the alter’ and not being able to make the film. She was excited at the notion that Macy had opted to volunteer his directorial abilities for the film. The result ended up being something they were all proud of, and something that was enjoyable to watch.